Jesus came preaching the gospel — the good news about the kingdom of God. What was the message? “The time is fulfilled, and the kingdom of God is at hand.” The Greek word for “time” here is not chronos, the word for chronological or sequential time, but kairos, a word that speaks of the rightness or ripeness of a time. It signifies the acute presence of a propitious moment. The announcement of the gospel Jesus preached is that the time has been fulfilled, the acute moment for the kingdom of God has arrived. That kingdom is now at hand. That is, it is here. It has come upon the scene and is now present among us. This kingdom is the one God promised long ago to Abraham, Isaac and Jacob. The one that would reign over all nations and be a blessing to all the families of the earth. The one that would have God’s Anointed — the Messiah, the Christ — as its king. This kingdom had finally arrived — present in the person of King Jesus — and now the world would never be the same again. John the Baptist came earlier to prepare the way for this King and this kingdom. He brought a baptism of repentance, because this kingdom would be about pardon for and freedom from sins (Mark 1:4). Many in Jerusalem and Judea came to him at the Jordan River and were bathed by him in its waters, confessing their sins (v. 5). John baptized them with water but he declared that the One who would come after him would baptize them with the Holy Spirit (v. 8). When Jesus came to be baptized of John — not for any sin of His own — the heavens parted as He came up out of the water, the Holy Spirit descended on Him, and the voice of the Father declared, “You are My beloved Son, in whom I am well pleased” (vv. 9-11). This identified Jesus as the fulfillment of Psalm 2 — the Messiah, Son of God, established as God’s King in Zion. The Greek word for “repentance” is metanoia and refers to a change of mind, a change of heart, a change of attitude, a change of will, the way you think and respond. It is a fresh start, departing from an old, dead way in order to embrace a new and living reality. True repentance must be followed by a fresh faith. There is no point in having a new beginning if you go right back to the same old ways of thinking and acting. Repentance is a change of belief that naturally results in a change of life. The object of this fresh faith is the gospel, the good news Jesus preached: The kingdom of God is here. The rule and reign of God has come into the world in the person of the King, Jesus the Messiah. And that changes everything! The kingdom of God has not yet come in all its fullness, though, but it has already begun. Jesus said, “From the days of John the Baptist the kingdom of heaven has been forcefully advancing, and forceful men lay hold of it” (Matthew 11:12 NIV). Luke’s Gospel has it this way: “The Law and the prophets were until John. Since that time the kingdom of God has been preached, and everyone is pressing into it” (Luke 16:16). Ever since those days, the kingdom of God has been forcefully advancing, pressing into the world, and those who are ready to take it by faith are pressing into it. It has already come; it is not yet in fullness.That sounds like a riddle, and theologians have referred to this as the paradox of already/not yet. What it means is that we are living in the in-between time. Every good story has a beginning, a middle and an end. We are in the middle. Our part in this story is to believe in the kingdom that has begun and will one day be completely revealed on earth. This in-between time requires constant repentance and constant faith. Every day is a new opportunity to turn from the old way of this present age and embrace the new reality of God’s kingdom breaking into the world. 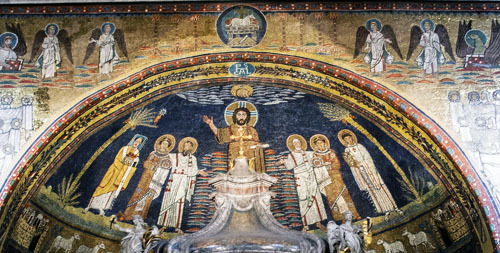 An opportunity to yield to the Spirit of God, given to us at Pentecost to dwell in and empower everyone who receives Jesus as King, and see heaven break forth on earth. The kingdom of God has come into the world and those who turn and believe King Jesus press into it by faith.